Throughout your body, there are locations where lymph nodes are found. They are small and bean-shaped that are found in groups that filter lymph fluid throughout specific areas of the body. Frequently people will notice lymph nodes in their neck because of the location and that they help fight some of the more common illnesses, infections and diseases. When a location in the body doesn’t have lymph nodes due to a Lymphadenectomy it can cause fluid to collect in the area where it was removed. The lymph nodes near nerve endings can cause pain and affect the function in that area of the body. The ones near organs may cause pressure and prevent the functioning of that organ. When an area of lymph nodes are swelling longer than a few days, you should have a medical professional examination. Doing so will help prevent any serious medical conditions be undiagnosed. Understand More About Swollen Lymph Nodes. Though there may be just a few groups of lymph nodes that draw attention like along your neck, under the arm and around the groin; however, there are many more location throughout the body adding up to roughly 500-700 of them. They start from the head all the way down to the knees, ready to fulfill their function to fight any pathogens; trap debris or even in rare cases battle cancer cells while the lymph is filtering throughout the body. Some are near the surface and others are deeper, which wouldn’t be noticed when swollen from a disease or infection. Each area distributes, filters and drains lymph fluid from various regions of the body. Some medications can cause the cervical lymph nodes to swell up, become tender, and be painful. The ones located under the arm can grow in response to breast cancer that was not diagnosed early and spread to the lymph nodes. An infection in the chest can also cause these nodes to enlarge. 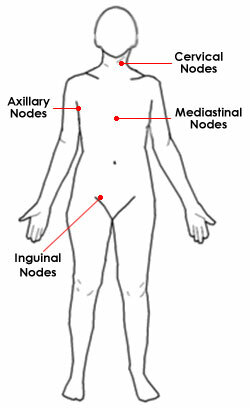 When there is a diagnosis of cancer (Cancer Diagnosis – cancer.stanford.edu ), the nodes in the area will be removed, and a biopsy performed. The fewer nodes removed, the better because the location where they are removed will be without a filter for the lymph, and it will interfere with the flow. This can cause side effects that are evident immediately or may not appear for months and even sometimes years after the surgery. The risk of not knowing that cancer has spread is greater than the risk of a lymphadenectomy even though each location plays an important role in the flow of lymph and the immune system.